Japanese engineers remotely guided a space station cargo craft back into the atmosphere Friday, destroying the garbage-filled spaceship as planned after a nearly two-month mission. The HTV resupply freighter fell back into Earth's atmosphere at about 0527 GMT (1:27 a.m. EDT). The spacecraft was expected to break apart and burn up from the heat of re-entry, and any leftover debris fell into a predetermined zone in the southern Pacific Ocean between New Zealand and Chile. The re-entry marked the end of a 55-day mission for the disposable cargo craft, which lifted off July 21 from Tanegashima Space Center in Japan. It was attached to the International Space Station for 47 days. The 33-foot-long H-2 Transfer Vehicle departed the space station Wednesday on an expedited flyaway after on-board software commanded an abort due to a computer dropout. Controllers in Tsukuba, Japan, overcame the computer glitch and activated a backup system later Wednesday. Three rocket burns on Thursday and Friday slowed the HTV's velocity and lowered its orbit enough to be captured by Earth's atmosphere. 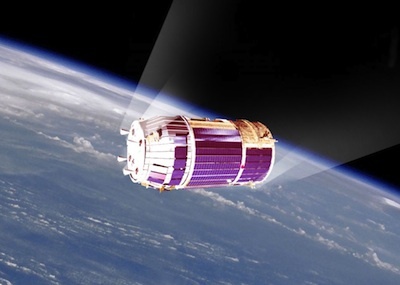 Two data recorders, one provided by JAXA and another by the Aerospace Corp., will log data on the re-entry conditions, such as position, acceleration, temperature and imagery. Engineers will incorporate the data in the design and operations of future spacecraft, yielding more accurate re-entry predictions, casualty expectations, and potentially leading to a "black box" for spacecraft similar to devices on airliners. The HTV is wrapping up a 47-day stay at the space station, in which the craft delivered food and clothing, an aquatic habitat experiment, an Earth observation camera, and other supplies. The cargo craft also delivered five small CubeSat satellites and a Japanese-built deployer apparatus. The CubeSats will be released outside the space station beginning this fall. The spacecraft, which is dubbed Kounotori 3, carried two research payloads mounted outside the space station. A NASA-led communications experiment launched aboard the HTV could lead to more capable and less complex spacecraft radios, and a Japanese experiment package includes a set of investigations probing plasma and lightning in Earth's atmosphere, collecting data on inflatable space structures and robotics systems, and testing commercial off-the-shelf HDTV video equipment in the harsh environment of space. The Kounotori 3 cargo freighter is the third of at least seven HTVs planned by JAXA to resupply the space station. Japan provides the HTV cargo service to pay for its share of the station's operating costs. Two previous HTVs successfully flew in 2009 and 2011. NASA and JAXA expect to negotiate for further HTV missions to cover the lab's supply needs and Japan's cost obligations through 2020, the currently planned end-of-life for the space station.